Acceleration (0–100 km/h [0–62 mph]) 4,2 sec. Acceleration (0–200 km/h [0–124 mph]) 13,4 sec. Automobili Lamborghini is expanding the most successful model line ever built under the sign of the bull with a very special car – the new Gallardo LP 550-2 Spyder combines the open spyder body style with purist rear Wheel Drive. This version brings together that stunning level of open-air driving fun that can come only from a super sports car with a folding roof and an unbelievably agile and spontaneous handling. 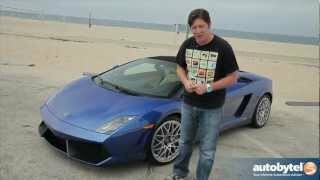 “With the Gallardo LP 550-2 Spyder, we are expanding the Lamborghini lineup with a purist model that adds yet another dimension of driving fun. The most important technical characteristics of the Lamborghini LP 550-2 Spyder are already recognizable from the model designation – LP stands for Longitudinale/Posteriore, for the mid-engine built longitudinally in front of the rear axle. 550 refers to the power output in hp, and the 2 stands for the drive to the rear wheels. At Lamborghini, the word spyder means the ultimate synthesis of a fascinating, powerfully expressive super sports car design, the ultimate open-air thrill and sheer pleasure for all the senses. The Lamborghini Gallardo LP 550-2 Spyder with rear-wheel drive is the perfect fit for the kind of sports car driver that enjoys a particularly hands-on and spirited style of driving. The setup is laid out to ensure that the rear end remains reliable and stable at all times, while the front axle steers with the highest level of precision and limits movement to an absolute minimum. Thanks to the supremely powerful V10 engine, controlled oversteer is not a problem, although always and only to the extent prescribed by the driver. 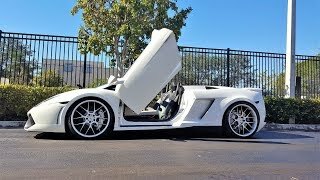 Its easy-to-control road manners and the ESP assistant system developed for these vehicles make the Gallardo LP 550-2 Spyder an outstandingly safe sports car to drive. In order to shape this unique character of driving fun and safety, the engineers in Sant’Agata Bolognese carried out extensive modifications to the Gallardo LP 550-2 Spyder, developing it specifically for these new characteristics. Not only was drive concentrated on the rear axle, the vehicle was also completely retuned in all its dynamic details. This Includes a specific dampers setting. The aerodynamics were also adapted to account for the change in the distribution of forces. The vehicle show out its goods with a rear axle with the 45-percent locking differential, and the adoption of the e-gear transmission. All completed with a fine adaptation of the ESP stability control system. While the standard program puts a priority on stability, the CORSA program allows larger drift angles and delivers a highly intensive appreciation of the full dynamics of the LP 550-2. All the excellent characteristics of the Gallardo chassis are fully retained – its pleasing bodyroll comfort, as well as its excellent directional stability at high speed. cars. The soft-top of the Gallardo Spyder is designed for unlimited top-speed enjoyment both open and closed. With the Gallardo LP 550-2 Spyder, Lamborghini is expanding its most successful model line of all time (to-date a total of nearly 11.800 have been built in Sant’Agata Bolognese) with a stunning variant that continues the successful individualization of its lineup. This includes the LP 560-4 Spyder, as well as the ultra-high-performance Gallardo LP 570-4 Spyder Performante, which boasts an even further weight reduction through carbon-fiber lightweight engineering. The latest version among the coupe variants is the Gallardo LP 570-4 Super Trofeo Stradale – the road-going version of the race car featured in the world’s fastest single-brand racing series. Frame Structural aluminium spaceframe, based on aluminium extruded parts weldedto aluminium casted joint elements. Acceleration (0–100km/h [0–62 mph]) 4,2 sec. Acceleration (0–200km/h [0–124 mph]) 13,4 sec.